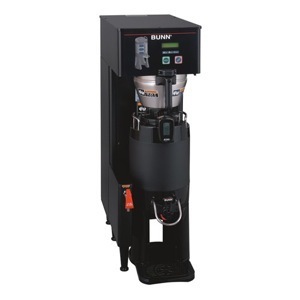 bunn-o-matic thermofresh brewwise brewer 34800.00 34600. •Brews 6.4 to 11.4 gallons (24.2 to 43.2 litres) of perfect coffee per hour. 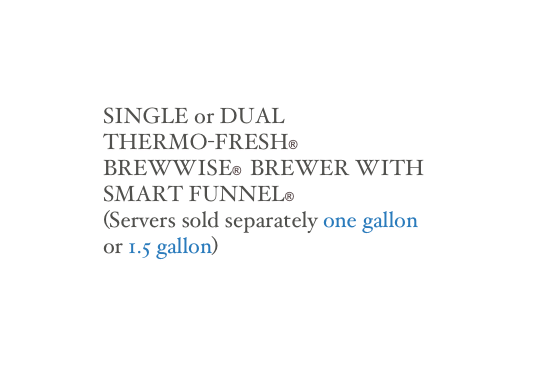 •Brews .5, 1 or 1.5 gallon (1.9, 3.8 or 5.7 litre) batches. •Stores individual coffee recipes so operator can easily brew many varieties. 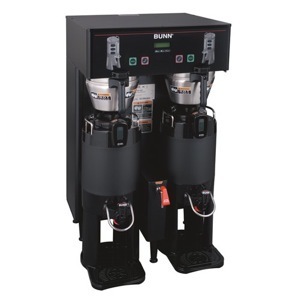 •Coffee extraction controlled with pre-infusion and pulse brew, digital temperature control, and large sprayhead; coffee strength controlled with variable by-pass. •Operate any combination of BrewWISE® equipment error-free with wireless brewer-grinder interface the Smart Funnel®. Example: MHG or G92T HD DBC grinders. •SplashGard® funnel and optional funnel locks help improve safety. •Black and stainless models available. •ThermoFresh® servers are vacuum insulated to keep coffee hot and fresh for hours. •Create coffee recipe cards with custom recipes, ad cards with messages that display on the brewer LCD, and dedicated funnels for special coffees with the Recipe Writer using your PC (Windows compatible). •Brews 16.3 to 18.9 gallons (61.7 to 71.5 litres) of perfect coffee per hour. •Easy Pulse interface allows automatic programming of pulse routine. •Operate any combination of BrewWISE® equipment error-free with wireless brewer-grinder interface through the Smart Funnel®. Example: MHG or G92T HD DBC grinders. •Create coffee recipe cards with custom recipes, ad cards with messages that display on the brewer LCD, and dedicated funnels for special coffees with the BrewWISE Recipe Writer using your PC (Windows® compatible).